In honor of me turning 30, I’m making mix CDs of my favorite songs from each of my 30 favorite musical artists/groups. Read the introductory post for more background information on my 30 at 30 project. Reminder: there is no scientific rationale for this list. They’re simply my personal favorites. 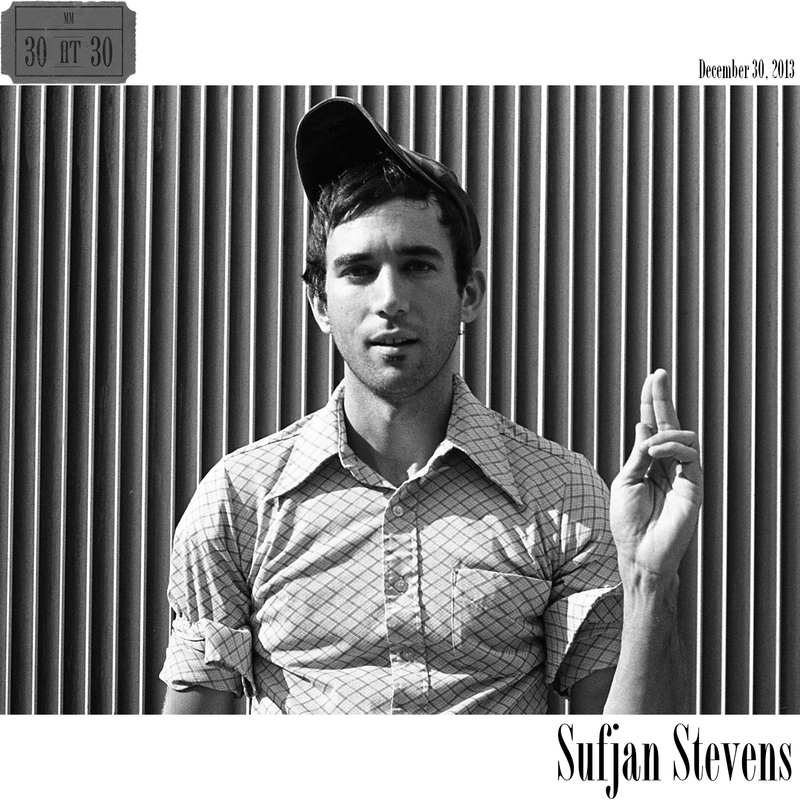 Coming in at number 26 is Sufjan Stevens. The 30 at 30 project has nothing on Sufjan Stevens’ purported 50 states project. Unfortunately, after Stevens’ magnificent musical takes on the states of Michigan (Greetings from Michigan: The Great Lake State) and Illinois (Come on Feel the Illinoise), follow-ups from the other 48 states never surfaced. It turns out the ambitious concept was too good to be true. Those two albums remain at the core of the Stevens that I have grown to love over the past several years, and so it is no surprise that 60 percent of the tracks that made the cut for this CD come from the state-themed albums. Sufjan Stevens’ music is not for everyone. Let me rephrase that. Not all of it is for everyone. However, if you listen to one Sufjan Stevens song, or even one album, it’s not necessarily a fair indicator of whether you’ll like the next song or next album. Stevens is not afraid to experiment musically, and the sound tends to vary from song to song and especially from album to album. It’s hard to believe that the tender, religious-themed acoustic, folk rock of Seven Swans and the Chinese zodiac themed electronic music of Enjoy Your Rabbit come from the same artist, but Stevens is the man behind both. I was first introduced to Stevens’ music via my sister-in-law Abby many years ago when I was just dating my then-girlfriend/now-wife Jessie. The song was “The Predatory Wasp of the Palisades Is Out to Get Us”, which is a tragic, beautiful song about a friend being stung by a wasp. Stevens’ song titles are sometimes as long as the songs themselves, but I think that’s part of his non-mainstream appeal. The hipster crowd was out in full force when Abby and I saw Stevens perform live in September of 2009 at the Beachland Ballroom in Cleveland. It was a mix of awesome and odd, which is an accurate representation of Stevens’ vast, eclectic musical catalog. It’s fair to say that I don’t care for some of Stevens’ styles, but I appreciate his versatility. The opening track on my compilation is “Djohariah”, a 17-minute meditation that would probably be more than some people are willing to tolerate. Personally, I love it. The first couple of minutes almost lulls you into a trance with the chorus “oooooh-ooh-ooh-ing” over and over again. The electric guitar work starts out seemingly in the background, but it quickly gets louder and more annoying. Then the horns come in, setting the table for the chant of “Djohariah, Djohariah” (the name of Stevens’ younger sister). Just when it feels like you can’t take the screeching of the electric guitar anymore it drops out at 5:43 as the name is repeated several times. You get about a 55-second reprieve before the guitar resumes in all of its improvisational, distorted annoying glory. The background chants have shifted from oohs to aahs along with steady drumming. Eventually, the refrain of “Djohariah, Djohariah” returns underneath the continued musical beatdown of electric guitar and drums. At the 10:50 mark, the guitar mercifully ceases and we are left with soothing horns, drums, and the continued refrain of “Djohariah, Djohariah.” It’s not until the 11:44 mark that we get into the bulk of the lyrical content of the song, but the wait is so worth it. The final five minutes seem to be Stevens’ attempt to show his sister just how amazing she and, in some sense, all women and mothers are. I’ve been blessed with an awesome sister (and mom) myself, so these words always resonate with me. It’s like the first 11+ minutes are fighting through all the stuff on our mind and heart that keeps us from expressing how we really feel. It’d be easy to switch the song to something softer, something more pleasant, but if we do that, we never get the payoff of those last five minutes. The same can be true in life. It’s worth working through the tough stuff, even if it’s not always comfortable, to get to what really matters. Maybe I’m philosophizing too much here, but something about this song’s length and musical structure does that too me. In a nod toward symmetry, I chose to close the compilation with another sister, “Sister Winter,” my favorite original from Volume 5 of Stevens’ incredible Songs for Christmas collection. All I can say is the final build towards “…to wish you a happy Christmas” always gives me goosebumps. Like his regular music, his Christmas collections vary from traditional to experimental, and the songs include both originals and covers with a Sufjan twist. Some are better than others, but “Sister Winter” is definitely a winner. In between the bookend sister tracks are three songs from the aforementioned Seven Swans, four songs from Greetings from Michigan: The Great Lake State, five songs from Come on Feel the Illinoise, and one track from The Avalanche. That lone track is the acoustic version of “Chicago”, a song so nice that I included it twice. The original version comes from Come on Feel the Illinoise, and while the lyrics are the same, the songs are two totally different experiences. But that shouldn’t be surprising given all that I’ve written already about Stevens’ ability to experiment and break the mold musically. 7. Say Yes! To M!Ch!Gan!